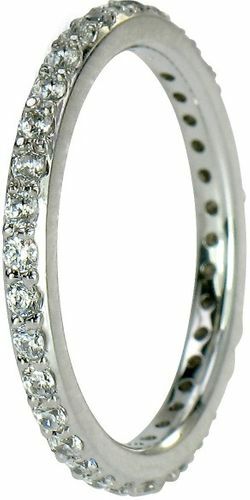 The Bandello Micro Pave Set Round Cubic Zirconia Eternity Band is a classic band that features a single row of pave set rounds set to perfection. This eternity band or also known as a wedding band measures approximately 2.15mm in width and includes just over 1 carat in total carat weight of the finest hand cut and hand polished original Russian formula lab created laboratory grown diamond quality cubic zirconia. Available in 14k yellow gold, 14k white gold, 14k rose gold and platinum. Alternate stone color options include man made ruby red, sapphire blue, emerald green and simulated canary yellow diamond, simulated pink diamond and the diamond look as shown in the image provided. The Bandello eternity band also makes great stacking bands! Whole and half finger sizes 5 through 8 are listed in the pull down menu and smaller and larger finger sizes are also available via special order. For further assistance, please call us directly at 1-866-942-6663, option 2 or visit us via live chat and speak with a knowledgeable representative.